The day after settlers seize the Zaatari family’s home in downtown Hebron, March 27, 2018. Photo credit: WAFA. Settlers attack the homes of the Kfeisheh and Jaber families in occupied Hebron. The same group of settlers who recently occupied the Za’tari home in downtown Hebron attempted to displace the Kfeisheh and Jaber families from their nearby homes on April 21, 2018. The settlers told the Kfeisheh family to leave their house and tried to enter it. The same settlers told the Jaber family to leave their home before threatening to take it over. Both homes are located in the center of the Old City near the Ibrahimi Mosque. Both attacks happened in the sight of Israeli soldiers who did not stop them. It seems that the settlers targeted the houses located in el Sahla in the downtown area, close to the Ibarahimi Mosque, in order to force residents to leave their homes. The settlers want to implement policies to control more and more of the Old City. The settlers targeted most of parts of this area, including the Jaber, Wadi Hussain and Salaima neighborhoods. 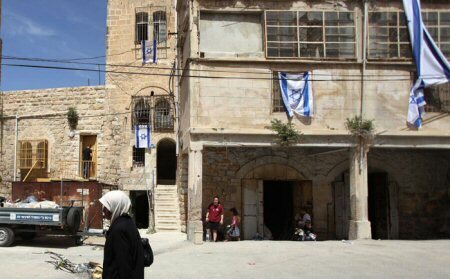 In downtown Hebron, five small settlements that house between 500 and 1,000 Israelis continue to expand onto Palestinian land and property. Settlers and soldiers infringe upon the human rights of neighboring Palestinians there everyday. Discriminatory policies and practices have transformed the downtown, where 55,000 Palestinians live, into a real ghetto governed by a system of Apartheid that benefits Israeli settlers. Local and grassroots movements, political parties, and activists have struggled to end the racist rule over the city for years. Ahmad Jaradat is the Senior Project Coordinator at the Alternative Information Center (AIC.